Dr. Catherine Pagano grew up on the South Shore of Long Island, NY. She attended Adelphi University, where she earned her Bachelor of Science in Biology and minored in Anthropology and Forensics. Dr. Pagano continued on to Tufts University School of Dental Medicine, receiving her Doctorate of Dental Medicine in 2004. She then completed a general practice residency at Montefiore Medical Center and received her Certificate in Pediatric Dentistry at Lutheran Medical Center, where she also served as chief resident. Committed to continuing her education, Dr. Pagano attends local lectures and studies research to stay current with advancing dental and medical techniques. 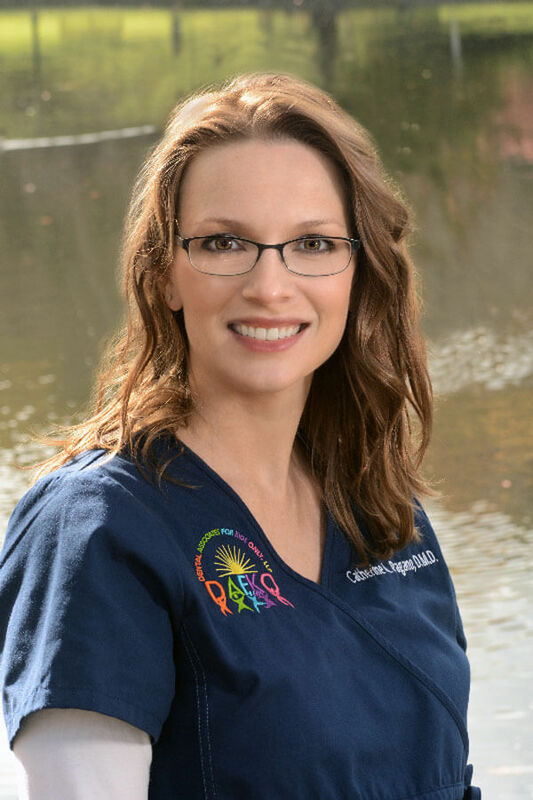 She is board certified by the American Board of Pediatric Dentistry. Dr. Pagano has been fortunate to travel as far as Trinidad and Tobago to treat sick children requiring extensive dental care. On a local level, she participates in numerous school health and child identification programs (CHIP), Give Kids a Smile Day, and visits schools and day care centers to introduce dentistry in a fun way. Dr. Pagano and her husband, Rich, were married in 2008 and welcomed a beautiful daughter, Chiara, at the end of 2011. They have a Shetland sheepdog named Nina and a crazy cat named Hamlet. In her free time, Dr. Pagano enjoys being home with her daughter and family, cooking, reading, traveling, and figure skating in the winter months.